How Did Ambrosia Apple Come to Be? You may have heard that Ambrosia apples are the result of a ‘chance seedling.’ This explanation leads to many more questions and further fuels the mystery of where Ambrosia apples came from. The technical explanation of a chance seedling is a genetically unique plant that has been unintentionally bred. There are new plants that are intentionally bred where scientists or orchardists might introduce pollen from one variety to the seedling of another variety. This is different from a chance seedling because in the case of a chance seedling, nature has played match maker. Even when nature gets it right, there’s no guarantee you’ll ever get to sink your teeth into it. 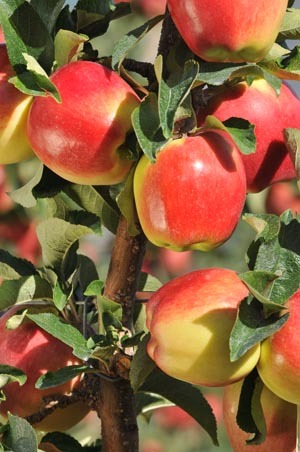 Several serendipitous things must happen for an new apple variety to make it to market. First, nature has to create a chance seedling. Second, the orchardist either has to give it a shot, ignore it, or not be able to see it. Third, someone has to taste the fruit and think it’s delicious enough to grow more of them. Speaking of Ambrosia, this better understanding of how a chance seedling comes to be doesn’t quite answer all of the questions in this mystery. There remains the mystery of parentage. You see, the little sprout came from one type of apple and would have been pollinated by a bee carrying (and dropping ) the pollen of another type of apple. So, which two apples? We don’t know the answer to that question. There are some educated guesses based on the area of the orchard where the chance seedling was found and what other apples were being grown in nearby rows. However, the seed could have come from an apple core dropped by a picker or a bird. Plus, bees have a pollination range of up to 9km – meaning they could be collecting pollen from anywhere in that range. In a farming area as diverse as the Similkameen Valley, that opens up a lot of potential parentage possibilities. For now, the case remains unsolved. We may never know what perfect coupling created the Ambrosia apple but maybe we don’t need to. After all, isn’t life better with a little mystery in it?